The Devil's Gulch area is a mountain bikers dream. Devil's Gulch is a classic long single track trail that can be shuttled to create a ride that is almost 100% downhill. Tronsen Ridge is loose rocky and technical. Combine Red Devil, Red Hill, and Red Hill Spur to create a great after work loop. Snow Covered Spring has arrived, bike season is just around the corner and we know people are itching to get out hiking and riding bikes, but please stay off trails that are snow covered or wet. Using wet trails in Central Washington create a lot of damage to our trails. The Devils Gulch Trailhead located 10 miles South of Cashmere on Mission Creek Road #7100 and is the lower trailhead for most trails in this area. Upper Devils Gulch Trailhead located on the Liberty-Beehive Road #9712, 4 miles from Beehive Reservoir. This trail begins on Mission Ridge Road just before the Mission Ridge Ski Area at the sharp left hand corner by the big rock and ends at the Beehive Trail #1202 where it crosses the Liberty-Beehive Road #9712. From Wenatchee, head south on Mission Street which becomes Squilchuck Road. 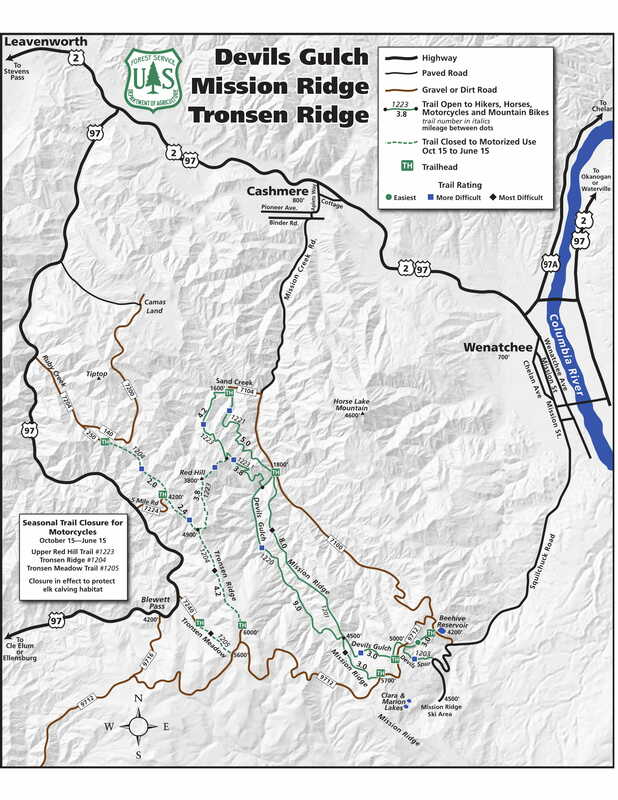 Follow this road for 13 miles until you reach the Mission Ridge Ski Area.